Two years ago, my wife and I considered buying a condominium in Victoria, British Columbia. The condo was about 100 feet from an ocean inlet, in one of Canada’s most beautiful cities. Just one thing made us nervous. It was across the street from a marijuana dealer. It’s easy to imagine a sketchy basement grow-op. Junkies loiter throughout the night. Police raids keep shutting it down, until it miraculously pops up again a few months later. But this dealer was different. It was clean. It attracted respectable clientele, and the police wouldn’t raid it. That’s because it was a medical marijuana dispensary. Such businesses are legal in Canada. The drug’s acceptance is also growing. On October 17, 2018, Canada will become only the second country in the world to legalize recreational marijuana. The United States might not be far behind. Recreational marijuana is now legal in nine U.S. states. 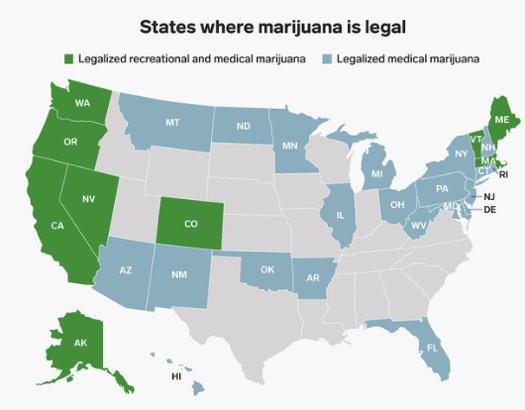 Medical marijuana is legal in thirty U.S. states. Investors are also rubbing their hands. Arcview Market Research says North American cannabis buyers spent $9.2 billion in 2017. In 2027, they expect sales to hit $47 billion. But they might be disappointed. In the United States, marijuana is still listed as a Schedule 1 drug. That means it isn’t legal at the federal level. As such, many of today’s cannabis growers and dispensers might go up in smoke. Pot-based investing comes with added risk. Plenty of people, however, hope to lessen such risks by buying an international marijuana industry ETF. Horizons Marijuana Life Sciences ETF might fit the bill. It’s a Canadian-based ETF that also trades over the counter in the United States. As of June 30, 2018, it had just 13.67 percent exposure to the American marijuana industry. Most of its holdings are Canadian businesses. They’re beyond the long arm of the U.S. federal government. The ETF’s growth has also been impressive. It gained 78.09 percent over the 12-month period ending July 30, 2018. Some U.S. based ETFs hold marijuana stocks. One example is Advisors Share Vice ETF (ACT). But it also includes alcohol and tobacco companies. Americans that want higher exposure to pot might prefer the ETFMG Alternative Harvest ETF (MJ). It tracks 36 stocks. Once again, most are Canadian. But with 21 percent exposure to the U.S. marijuana industry, it might be riskier. It also has a strange backstory and some unusual stock holdings. Before December 27, 2017, it was a Latin American real estate index. But, virtually overnight, it morphed into a marijuana index. Strangely, its September 30, 2017 annual report didn’t inform investors about its upcoming switch. Plenty of its holdings also have little or no exposure to the marijuana industry. Such unrelated stocks include Philip Morris International, British American Tobacco, Swedish Match, Scandinavian Tobacco, Universal Corporation, Japan Tobacco, Altria, Imperial Brands and Vector Group. They total more than 10 percent of the ETF’s total capitalization. Plenty of other U.S.-based marijuana ETFs might crop up, much as they have in Canada. But if you decide to take the risk, keep your exposure small. If you water too many weeds, and they start to wilt, it could wreck your portfolio’s garden.